Definition at line 53 of file lloverlaybar.h. Definition at line 106 of file lloverlaybar.h. Definition at line 116 of file lloverlaybar.cpp. 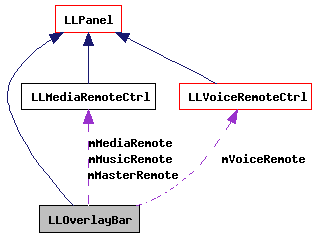 References LLUICtrlFactory::buildPanel(), LLPanel::childSetAction(), createMasterRemote(), createMediaRemote(), createMusicRemote(), createVoiceRemote(), FALSE, gUICtrlFactory, layoutButtons(), mBuilt, LLView::mIsFocusRoot, onClickIMReceived(), onClickMouselook(), onClickReleaseKeys(), onClickSetNotBusy(), onClickStandUp(), LLUICtrl::setIsChrome(), LLView::setMouseOpaque(), LLView::setRect(), and TRUE. Definition at line 152 of file lloverlaybar.cpp. Definition at line 76 of file lloverlaybar.cpp. Definition at line 86 of file lloverlaybar.cpp. Definition at line 96 of file lloverlaybar.cpp. Definition at line 106 of file lloverlaybar.cpp. Definition at line 253 of file lloverlaybar.cpp. References LLViewerImage::bindTexture(), LLFocusMgr::childHasKeyboardFocus(), LLPanel::draw(), gBottomPanel, gColors, LLView::getChildList(), LLControlGroup::getColor(), LLImageGL::getHeight(), LLViewerImageList::getImage(), LLControlGroup::getS32(), LLControlGroup::getString(), LLImageGL::getWidth(), gFocusMgr, gImageList, gl_segmented_rect_2d_tex(), glColor4fv, gSavedSettings, gViewerArt, MIPMAP_FALSE, LLColor4::mV, r, ROUNDED_RECT_TOP, S32, LLUUID::set(), and TRUE. Definition at line 576 of file lloverlaybar.cpp. References LLPanel::childSetEnabled(), LLPanel::childSetVisible(), FALSE, LLControlGroup::getBOOL(), LLMediaEngine::getInstance(), gOverlayBar, gSavedSettings, and TRUE. Definition at line 545 of file lloverlaybar.cpp. References LLPanel::childSetEnabled(), LLPanel::childSetVisible(), FALSE, gAudiop, LLControlGroup::getBOOL(), gOverlayBar, gSavedSettings, LLAudioEngine::isInternetStreamPlaying(), S32, and TRUE. Definition at line 162 of file lloverlaybar.cpp. Definition at line 157 of file lloverlaybar.cpp. Definition at line 178 of file lloverlaybar.cpp. References count, LLView::getChildCount(), LLView::getChildList(), LLView::getRect(), LLControlGroup::getS32(), LLRectBase< Type >::getWidth(), gSavedSettings, i, llround(), lltrunc(), mMasterRemote, mMediaRemote, mMusicRemote, LLView::mRect, mVoiceRemote, r, right, S32, LLView::setRect(), LLView::updateRect(), and width. Referenced by LLOverlayBar(), and reshape(). Definition at line 475 of file lloverlaybar.cpp. References LLMediaEngine::getInstance(), gOverlayBar, mMediaState, LLMediaEngine::pause(), and PAUSED. Definition at line 460 of file lloverlaybar.cpp. References LLMediaEngine::convertImageAndLoadUrl(), LLViewerParcelMgr::getAgentParcel(), LLMediaEngine::getInstance(), gOverlayBar, gParcelMgr, mMediaState, and PLAYING. Definition at line 70 of file lloverlaybar.h. Definition at line 485 of file lloverlaybar.cpp. References LLMediaEngine::getInstance(), gOverlayBar, mMediaState, LLMediaEngine::stop(), and STOPPED. Definition at line 518 of file lloverlaybar.cpp. References gAudiop, gOverlayBar, mMusicState, PAUSED, and LLAudioEngine::pauseInternetStream(). Definition at line 496 of file lloverlaybar.cpp. 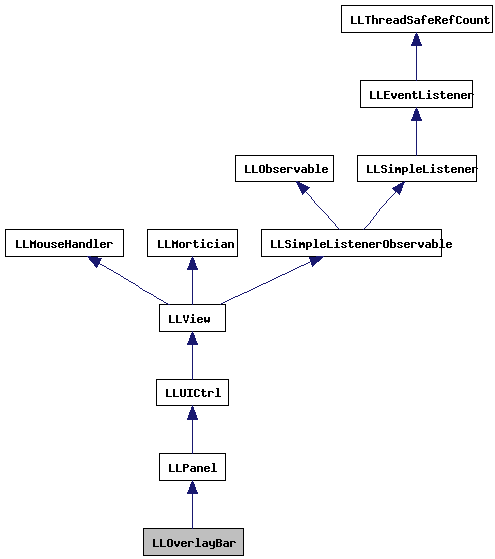 References gAudiop, LLViewerParcelMgr::getAgentParcel(), LLParcel::getMusicURL(), gOverlayBar, gParcelMgr, mMusicState, PLAYING, and LLAudioEngine::startInternetStream(). Referenced by callback_start_music(), optionally_start_music(), and LLMediaRemoteCtrl::postBuild(). Definition at line 71 of file lloverlaybar.h. Definition at line 531 of file lloverlaybar.cpp. References gAudiop, gOverlayBar, mMusicState, LLAudioEngine::stopInternetStream(), and STOPPED. Definition at line 418 of file lloverlaybar.cpp. References gIMMgr, LLIMMgr::setFloaterOpen(), and TRUE. Definition at line 444 of file lloverlaybar.cpp. Definition at line 432 of file lloverlaybar.cpp. Definition at line 438 of file lloverlaybar.cpp. Definition at line 425 of file lloverlaybar.cpp. Definition at line 450 of file lloverlaybar.cpp. References AGENT_CONTROL_STAND_UP, gAgent, and LLAgent::setControlFlags(). Definition at line 327 of file lloverlaybar.cpp. References LLAgent::anyControlGrabbed(), LLAgent::cameraMouselook(), LLPanel::childSetEnabled(), LLPanel::childSetVisible(), CONTROL_ML_LBUTTON_DOWN_INDEX, CONTROL_ML_LBUTTON_UP_INDEX, FALSE, gAgent, gAudiop, LLViewerParcelMgr::getAgentParcel(), LLAgent::getAvatarObject(), LLControlGroup::getBOOL(), LLAgent::getBusy(), LLIMMgr::getIMReceived(), LLMediaEngine::getInstance(), LLParcel::getMusicURL(), gIMMgr, gParcelMgr, gSavedSettings, LLAgent::isControlGrabbed(), LLVOAvatar::mIsSitting, mMediaRemote, mMusicRemote, mVoiceRemote, LLView::setEnabled(), LLView::setVisible(), TRUE, and LLVoiceClient::voiceEnabled(). Referenced by LLViewerWindow::handlePerFrameHover(), and stop_video(). Definition at line 168 of file lloverlaybar.cpp. References layoutButtons(), mBuilt, and LLView::reshape(). Definition at line 611 of file lloverlaybar.cpp. Definition at line 105 of file lloverlaybar.h. Definition at line 101 of file lloverlaybar.h. Definition at line 103 of file lloverlaybar.h. Referenced by layoutButtons(), and refresh(). Definition at line 107 of file lloverlaybar.h. Referenced by mediaPause(), mediaPlay(), mediaPlaying(), and mediaStop(). Definition at line 102 of file lloverlaybar.h. Definition at line 108 of file lloverlaybar.h. Referenced by musicPause(), musicPlay(), musicPlaying(), and musicStop(). Definition at line 104 of file lloverlaybar.h.